Alkane are the simplest family of hydrocarbons – compounds containing carbon and hydrogen only. They only contain carbon-hydrogen bonds and carbon-carbon single bonds. All organic carbon compounds are named according to the number of carbon in the molecule. The name is made up of two parts: the stem and the suffix. The suffix tells the homologous series of the compound. 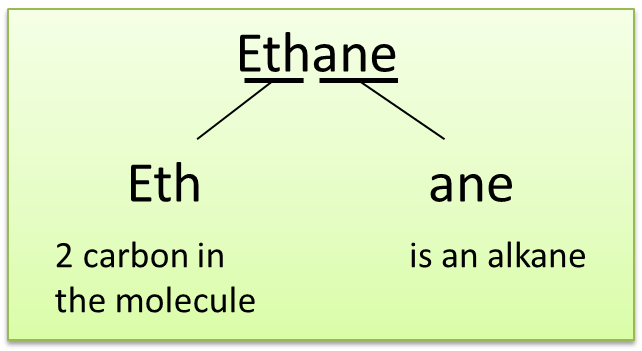 Ethane is an alkane, the stem “eth” tell us that it has 2 carbon in the molecule, and the suffix “ane” indicates that it is a member of the alkanes homologous series. The table below shows the naming code for the stem. In SPM, You will need to remember the codes for the number of carbon atoms in a chain up to 6 carbons. The table below shows the molecular formula and name of the first 8 members of alkanes. Alkanes are covalent compounds, hence their physical properties are similar to other covalent compounds. The atoms in an alkane molecule are bonded together by strong covalent bonds (intramolecular forces). The molecules are held together by weak Van der Waals forces (intermolecular forces). 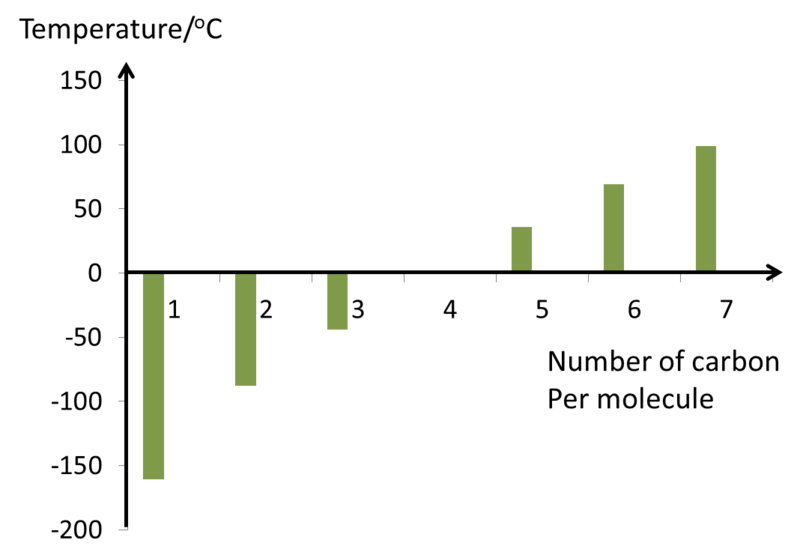 The boiling point of alkane increase when the number of carbons in the molecule increases. This is due to the increase of Van der Waal force when the size of the molecule increases. 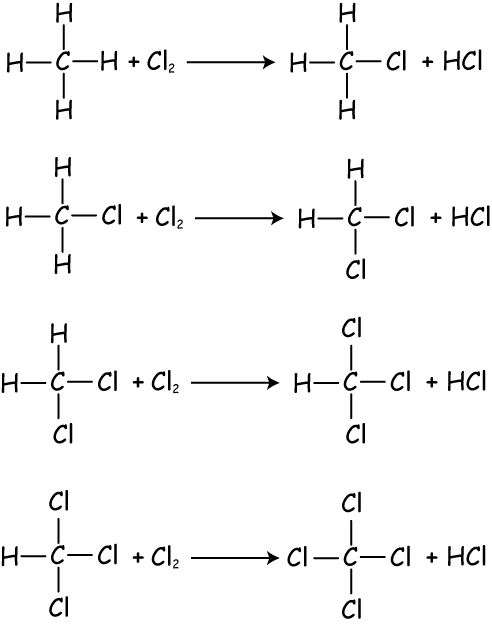 The boiling points shown are all for the “straight chain” isomers when there are more than one. The first four alkanes are gas at room temperature. Alkanes are insoluble in water, but dissolve in organic solvents. The liquid alkanes are good solvents for many other covalent compounds. The density of water is higher than density of most alkanes. When going down the series, relative molecular mass of alkanes is higher due to the higher force of attraction between molecules and alkane molecules are packed closer together. All members in alkanes do not conduct electricity. Alkanes are covalent compounds and do not contain freely moving ions. Alkanes are chemically less reactive compared to the other carbon compound such as alkene, alcohol or carboxylic acid. Alkanes do not react with chemicals such as oxidizing agents, reducing agents, acids and alkalis. Alkanes are saturated hydrocarbon with strong carbon-carbon (C – C) bonds and carbon-hydrogen (C – H) bonds. All the bonds are single bonds which require a lot of energy to break. Alkanes are chemically less reactive because they contain only strong covalent bonds which need a lot of energy to break. All alkanes undergo combustion to produce water and carbon dioxide (or carbon monoxide/carbon in incomplete combustion). Incomplete combustion occurs when there isn’t enough oxygen present. In an incomplete combustion, carbon or carbon monoxide will be produced as the product of the reaction. Carbon monoxide is a colourless poisonous gas. The hydrocarbons become harder to ignite as the molecules get bigger. Combustion of alkanes with bigger molecule will produce more soot as the percentage of carbon of the molecule is higher. The amount of soot produced depends on the percentage of carbon in a hydrocarbon molecule. Lets calculate the percentage of carbon in a methane and a hexane. The bigger the molecule of an alkane, the higher the percentage of carbon, and hence produces more soot during combustion. The substitution reaction is a reaction where one atom (or a group of atoms) in a molecule is replaced by another atom (or a group of atoms). Substitution reaction of alkanes occurs when an alkane is mixed with a halogen in the presence of sunlight (ultraviolet light). Since the substitution reaction of alkanes is the reaction between alkanes and halogen, hence it is also called the halogenation reaction. The substitution reaction is a slow reaction. Substitution reaction of alkanes takes place only in the presence of ultraviolet light (such as sunlight). We can see that, in the reaction, each hydrogen atom in the alkane molecule is substituted one by one by a chlorine atom. The sunlight or UV light is needed to break the covalent bond in halogen and alkane molecules to produce hydrogen and chlorine atom. Alkanes also react with bromine vapour in the presence of UV light, but with a much lower rate.